East Caribbean States, 10 dollars, 1981. Royal Wedding of Charles and Diana. This next one is slightly off-topic. In order to commemorate the wedding of Charles and Diana, the East Caribbean States (or Territories) simply added "ROYAL WEDDING" to the legend and placed a map of the islands next to the usual ship. Nowadays, you might look at the legend and wonder "WHOSE wedding?". 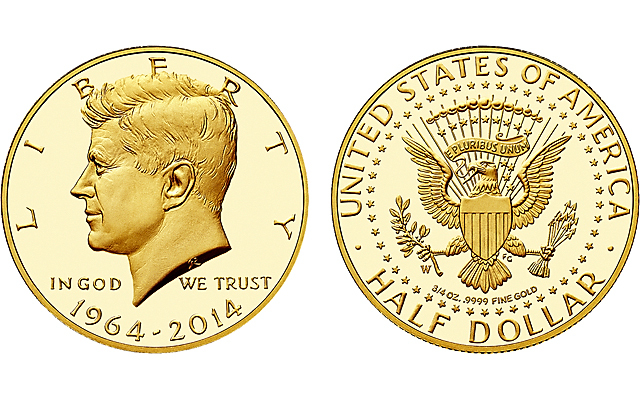 Nor does the altered design relate to the commemorated theme. 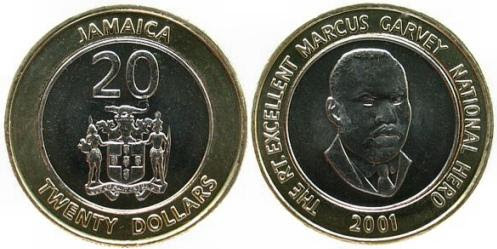 Compare it with the regular dollar design, below. FWIW, the ship is a galleon, so it may well be the "Golden Hind", which has no connection with any royal wedding either. Queen Elizabeth obviously liked him, but she didn't marry him. The ship certainly is intended to be Sir Francis Drake's "Golden Hind". See: Galleons. 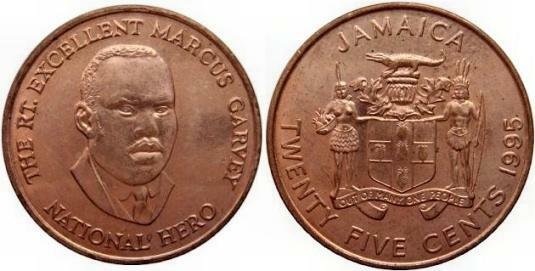 Jamaica, 25 cents, 1985. 25th anniversary of the bank of Jamaica. In 1976 the Seychelles issued its first full coinage as an independent country. The legend on the reverse of all the coins was: "INDEPENDENCE 1976". Here you see the Seychelles 1 cent of 1977. The word INDEPENDENCE has been removed. Seychelles, 5 cents, 1976. INDEPENDENCE. Seychelles, 5 cents, 1977. PRODUCE MORE FOOD. The design was amended in 1977 to carry a FAO slogan. Seychelles, 10 cents, 1976. INDEPENDENCE. Seychelles, 10 cents, 1977. PRODUCE MORE FOOD. Seychelles, 25 cents, 1976. INDEPENDENCE. Seychelles, 25 cents, 1977. "INDEPENDENCE" has been removed from the legend. Robert Elderton of the Royal Mint amended the design slightly for 1982, in order to move the parrot higher up the coin and remove the blank space. Seychelles, 50 cents, 1976. INDEPENDENCE. Seychelles, 50 cents, 1977: without "INDEPENDENCE". Seychelles, 1 rupee, 1976. INDEPENDENCE. Seychelles, 1 rupee, 1977: without "INDEPENDENCE". Seychelles, 1 rupee, 1982. A different solution was found for this denomination. Seychelles, 5 rupees, 1976. INDEPENDENCE. Seychelles, 5 rupees, 1977: without "INDEPENDENCE".